Call it Veterans Day, Remembrance Day, or Poppy Day, Nov. 11 is a time to honor those who have served in their countries' armed forces. At least 20 countries around the world celebrate the day. This month's Weekend Sprintathon will do so as well. Veterans, please add a /V to your names during the normal exchange. Then include the number of years you served. If you served four years, you would send /V4. All others are asked to send a /C for civilian. For this event, a veteran is someone who has served in uniform: Army, Air Force, Navy, Marines, and Coast Guard or its equivalent, as well as reservists or members of the National Guard. Because the day is recognized internationally, any SKCC member outside the United States who has served in his or her country's military also is invited to use the /V# designation. For non-veterans: You earn a bonus for each unique WES participant who is a veteran. Only one QSO per veteran-member counts; no multiband contacts with the same vet for bonus points, although such contacts will, as always, count toward your basic QSO total. Your bonus is the sum of the years served for the veterans you contact. For example: If you contact two veterans, and their combined years of service equal 12, that's your bonus score. For veterans: Your bonus for a contact with another veteran is the combined years of service represented in the QSO -- yours and the other member's. If you served 5 years and the other member served for 11, you each get 16 bonus points for the contact. As with non-vets, no multibands for these bonus points. Finally, all participants can earn additional bonus points by using letters in the call signs from stations you work to spell out the last names of the lead signatories of the Treaty of Versailles: Wilson, George, Clemenceau, Muller, and Bell. Score 25 points for each fully spelled name. Letters from a given call sign can be used only once. For instance, if you need two Ls and one call has two, you can use both from that call, but only once. If you need another L, you’ll need to contact another participant with an L in his or her call sign for the additional one. Your bonus total = QSO bonus points + name-spelling points. Jerry Bliss, K6III, has prepared a spreadsheet to help you keep track of your bonus progress. You can download it here. The event runs from 1200 UTC Nov. 12 through 0000 UTC Nov. 14. For October: From the depths of the junk box, unspeakable keys! If Dr. Frankenstein (DF) -- No, no, Frank-en-steen! Now, walk this way -- could cobble together something almost human from, er, spare parts, think of the keys you could build with parts culled from your junk box! For October's Weekend Sprintathon, you're encouraged to rummage through the junk box, the kitchen odds-'n'-ends drawer, wherever, and cobble together a DF key. It can be as simple or complex as you like. But to qualify for a keymaker bonus, you must make it from scratch for this event. Anyone who uses a DF key freshly minted for the event automatically earns 200 bonus points. If you field a new homemade key, please add /df to your name during your exchanges. If one /df station contacts another /df station, each station can claim 50 points for the QSO. If you opt not to make a key, you earn 25 bonus points for each QSO with an /df operator. Multiband contacts with the same /df station are permissible. Any station can earn another 100 bonus points for using letters from the call signs they log to spell out Victor Frankenstein. As usual, letters from a given call sign can be used only once. If you need two Es and a call has them both, great. If a call has only one, you'll need to work another station whose call contains an E.
October's WES runs from 12:00 UTC Oct. 8 through 00:00 UTC Oct. 10. "It's on the air!!!!" Your transmitter must tune with crystals. and of VFOs be wistful. Those were the days when a Novice license was good for one year and was non-renewable. It was up or out. For September's WES, we'll re-live a bit of those yesteryears. Stations using crystal-controlled transmitters will be worth bonus points to those who contact them, with an added incentive to be rockbound. For stations using xtals, please add /x to your name during your WES exchanges. For the VFO crowd, a contact with an xtal-controlled station will be worth 100 points. However, contacts between xtal-controlled stations will be worth 200 points for each of the two stations in the QSO. In addition, an operator using an xtal-controlled transmitter or transceiver can claim 1 multiplier point for each hour operating with that rig -- one-hour increments only, please. This multiplier should be applied to the xtal-bound operator's raw QSO count before entering that total on the WES submit page. Example: 5 hours operating and 300 QSO points = 1,500 QSO points. Multiband contacts with the same xtal-controlled station are allowed for bonus points. Stations using crystals are strongly encouraged to use the K3UK sked page to post their transmit frequency. If you're operating split, please specify your receive frequency as well. And please post pix of your xtal rig when you submit your score. September's Weekend Sprintathon will run from 1200 UTC Sept. 10 through 23:59 UTC Sept. 11. The Weekend Sprintathon's annual boat-anchor regatta is looming on the horizon. If your rig has tubes, you're worth bonus points. For this event, any transmitter, receiver, outboard VFO, or transceiver that uses tubes qualifies as a boat anchor, even if you finished building the radio yesterday. Count the number of tubes in the rig you are using. You can count tubes in your power supply, transmitter-receiver pair, hybrid transceiver, as well as in an external VFO you hook up to a crystal-controlled transmitter. During your WES exchanges, send name/number. For instance, if Rufus's rig has 5 tubes, he sends Rufus/5. If you contact him, you earn 5 bonus points for the QSO. If one boat-anchor participant contacts another boat-anchor participant, each station can claim the sum of both tube numbers used in the QSO. If Rufus/5 contacts Bob/6, each can claim 11 bonus points for the QSO. Multiband contacts with the same boat-anchor station for bonus points are permissible. When the event ends, add the number of tube points you've logged. That's your bonus subtotal. Subtotal? Yep. You can earn additional bonus points, but you'll need to solve a theme-related crossword puzzle first. The puzzle's answers will build a list of words. Once you've built the list, use letters from the call signs in your WES log to spell out as many of those words as you can. If you can't solve the whole puzzle, just use the words you were able to get. You may use all of the letters in a call sign as needed, but you can pluck letters from that call sign only once. For instance, if you need Es and you work W1ERD, you can use the E from that call only once. If you work W1EE, you can use both Es, but only once each from that call. Need more Es? Work another WES participant with an E in his or her call sign. Each completed word is worth 25 points. There are 15 words, so the maximum points available from the word-spell bonus is 375. Your bonus total = total "tube" points + total "word-spell" points. You can download the crossword puzzle here. In addition, Jerry Bliss, K6III, has prepared a spreadsheet to help with scoring for those who would like to use it. You can download it here. You can download the crossword solution here. August's WES runs from 12:00 UTC Aug. 13 to 23:59 UTC Aug. 14. I'll post the crossword puzzle here at 00:00 UTC (plus or minus a few minutes) on Saturday, Aug. 13. I'll post the crossword answers after the submit window closes at 23:59 UTC Aug. 21. For July: "To keys! To keys! The SKCCers are coming!" July's WES aims to recognize the major players in the United States' Revolutionary War**: the 13 original colonies, plus Britain and France. This year, we're also encouraging members who enjoy portable operations to participate from any of the Revolutionary War sites listed under the ARRL's National Parks on the Air (NPOTA) activity, which runs through the end of the year to help celebrate the National Park Service's Centennial. The original colonies include: GA, SC, NC, VA, MD, PA, DE, NJ, NY, CT, RI, MA, and NH. For this event and this event only, either ME or MA count as MA. Likewise, VA and WV count as VA. If you plan to operate from one of these sites and use LoTW, don't forget to post your activation information at https://npota.arrl.org/register-activation.php. If you don't use LoTW, you can still operate from a site for WES purposes. If you hear a member at a Revolutionary site, please be sure to spot the operator on the K3UK Sked page. You'll find a link to it in the navigation column at left. Or spot yourself if you are said operator. Pile-ups are fun! A QSO with a member in each of the 13 colonies is worth a one-time bonus of 25 points. Contact any member in the UK (not just England) and France for a one-time bonus of 100 points each. Sweep all 13 colonies, and you can multiply your colonies bonus by 2. Sweep the UK and France, and you can multiply the UK/France total by 2. Your bonus subtotal is the sum of your colony points and your UK/France points. This represents a maximum possible bonus of 650 (colony sweep) + 400 (UK-France sweep) = 1050. Finally, a QSO with an SKCC station at an NPOTA Revolutionary War site is worth a one-time bonus of 500 points per site. NPOTA to NPOTA SKCC QSOs (one site to another) are worth 1000 points for each of the two stations in the QSO. SKCC stations operating from Revolutionary sites should give out the NPOTA number as well as their SKCC number, in case members are participating in NPOTA. Add your Revolutionary War site total to your subtotal for your grand total. The event runs from 12:00 UTC July 9 through 23:59 UTC July 10. Praise Morse and pass the RF! We have over 500 Canadian SKCC members in the provinces and territories. Let's have a Connection to Canada for June's Weekend Sprintathon! Canadian Operator (CO): Any SKCC member who operates within the Canadian Provinces or Territories. Non-Canadian Operator (NCO): Any SKCC member who operates outside the Canadian Provinces or Territories. You can make one contact per band with the same station to claim more bonus points. Check your claimed bonus score before you submit: Your bonus points must be divisible by 10 with no remainder. The June WES runs from 1200 UTC Saturday June 11, 2016 to 2359 UTC Sunday June 12. "QRP Is Hear Again the Skies Are Almost Clear Again" - sung to the tune of "Happy Days Are Here Again". For the Merry Month of May, the theme is QRP! And on to the bonus points! -A QRO to QRO contact is worth 0 bonus points. -Each station in a QRO to QRP contact earns 10 bonus points per unique contact per band. -Each station in a QRO to QRPp contact earns 20 bonus points per unique contact per band. -Each station in a QRP to QRP contact earns 30 bonus points per unique contact per band. -Each station in a QRP to QRPp contact earns 40 bonus points per unique contact per band. -Each station in a QRPp to QRPp contact earns 50 bonus points per unique contact per band. or, if you prefer, your actual power in watts or milliwatts. The May WES runs from 1200 UTC Saturday May 7, 2016 to 2359 UTC Sunday May 8. Our membership is composed of hams of all ages - and we're not talking about our birth dates. This month lets track down how many years we have been practicing our fine hobby. In your exchange with another station send the number of years you have been a ham. Count your first year and the current year, no matter how short, as a full year. So, WB7EUX was first licensed as WN7JYK on 5/7/1968. WB7EUX can count 1968 as his first year. The formula to calculate How Long a Ham: Current Year minus First Year plus 1. For WB7EUX that would be 2016 - 1968 + 1 equals 49 years. The exchange would be: RST SPC NAME / Years A Ham SKCC NUMBER. - If you have an exchange without ham years both ways, then you receive zero bonus points. - If you transmit your ham years but don't receive ham years in return give yourself credit and add on 5 bonus points. - If you receive ham years from the other op but forget to send yours, give yourself 5 bonus points. - If you successfully transmit and receive ham years then give yourself 10 bonus points. You can exchange your ham years with another station once per band. So if you exchange ham years both ways and you have the exchange on three bands with the same station you would receive 30 bonus points. Wait, what if I dropped out of amateur radio (became unlicensed - like WB7EUX did) during the calculation period? Let's just say you were a ham at heart during those bleak, missing years and don't exclude them. As always, the regular scoring rules of the Weekend Sprintathon apply. And remember, it's not the age of the ham that matters - it's the ham in the years. Thanks to Ron, AC2C, for suggesting this WES theme. The April 2016 Weekend Sprintathon will run from 1200 UTC, Saturday April 9 until Sunday April 10 at 2359 UTC. Glenn Miller and his orchestra were arguably one of the most influential musical powerhouses of the 20th century. Glenn's birthday is March 1, 1904. For our March Weekend Sprintathon lets make some music with Glenn's name, his birth place in Iowa, and one of his most popular songs. - His name, Glenn Miller, for 25 bonus points. - His birth place in Iowa, the town only, Clarinda, for 25 bonus points. - The song title, In the Mood, for 25 bonus points. - Spell any two of the above for an extra 50 points. - Spell all three and give yourself 75 extra points. - The two sweeteners are not mutually exclusive. The maximum number of bonus points for spelling his name, birth place, song title, the "two" bonus sweetener, and the "three" bonus sweetener is 200. The maximum number of bonus points for spelling any combination of two; name and birth place, name and song title, or birth place and song title and the "two" bonus sweetener is 100. Spell one combination and give yourself 25 bonus points. As in past sprintathons, you can use the letters from a call sign only once. Music is in the air for our March 2016 Weekend Sprintathon! The March 2016 Sprintathon runs Saturday, March 12 starting at 1200 UTC and ends on Sunday, March 13 at 2359 UTC. Also, some locales around the globe may switch to Daylight Savings Time during the WES. Observe UTC time for start and end. We have one of the fastest growing CW clubs in the world. In fact, it's amazing. Let's welcome all our newest members who have joined since 2015 with the New Members Weekend Sprintathon. Any member that you contact with a membership number greater than 13244 counts as a 25 point bonus. Any new member (those with a membership number greater than 13244) that contacts another new member (those with a membership number greater than 13244) counts as 50 points for each operator. Multi band contacts are permissible. Note that members who joined up from 2015 through the end of the February 2016 WES count as new members. With over 1800 new members since the beginning of 2015 you will have many opportunities to gain points. And for a dash of extra excitement, spell the words "Newbie Welcome" from call signs you collect and gain a 100 point bonus. As usual, you can only use the letter from a call sign once. Thus someone who collects WB7EUX will need three more Es from other call signs. If you can complete only one of the words, give yourself 50 bonus points. So, let's all encourage our newer members to join the February New Members Sprintathon and have a great time! This event runs from 1200 UTC Feb. 13 to 23:59 UTC Feb. 14. K3Y this month celebrates the club's anniversary, so this month, the club's Weekend Sprintathon celebrates those who founded the club or joined it during its inaugural year, 2006. Any member whose number is 2545 or lower is worth a one-time bonus of 25 points. If one inaugural-year member contacts another inaugural-year member, each can claim 50 bonus points for the QSO. You can claim bonus points for an inaugural-station contact once per band. Contacts with K3Y stations count, but once a K3Y operator is off duty and operating under his or her original call, be careful of dupes. A contact with K2DUH after working that operator as a K3Y station on the same band is a dupe. In keeping track, SKCC numbers are your friends. Many thanks to those first 2,545 members who poured the foundation for SKCC! And many thanks to the volunteers this year serving as K3Y stations! January's Weekend Sprintathon runs from 12:00 UTC Jan. 9 to 23:59 UTC Jan. 10. Remember him? He could fashion what he needed to escape the bad guys out of just about any odd combination of stuff lying around his holding pen. For this Weekend Sprintathon, you're encouraged to rummage through the junk box, the kitchen odds-'n'-ends drawer, wherever, and cobble together a homemade key. It can be as simple or complex as you like. But to qualify for the keymaker bonus, you must make it from scratch for this event. Keymaker bonus, you say? Anyone who uses a freshly minted homemade key for the event automatically earns 200 bonus points. If you do field a new homemade key, please add /hk to your name during your exchanges. If one /hk station contacts another /hk station, each station can claim 50 points for the QSO. If you opt not to make a key, you earn 25 bonus points for each QSO with an /hk operator. Multiband contacts with the same /hk station are permissible. Any station can earn another 100 bonus points for using letters from the call signs they log to spell out Inner MacGyver. As usual, letters from a given call sign can be used only once. If you need two Es and a call has them both, great. If a call has only one, you'll need to work another station whose call contains an E.
Call it Veterans Day, Remembrance Day, or Poppy Day, Nov. 11 holds a special place in the pantheon of annual national holidays -- a time to honor those who have served in their countries' armed forces. At least 20 countries around the world celebrate the day. This month's Weekend Sprintathon is designed to do so as well. Veterans, please add a /V to your names during the normal exchange. In addition, please add the number of years you served to the V. If you served four years, you would send /V4. All others are asked to send a /C for civilian. For this event, a veteran is someone who has served in uniform: Army, Air Force, Navy, Marines, and Coast Guard or its equivalent, as well as reservists or members of the National Guard. Because the day also commemorates the end of World War 1, any SKCC member outside the United States who has served in his or her country's military also is invited to use the /V# designation. For non-veterans: You earn a bonus for each unique veteran contacted. Only one QSO per veteran-member counts; no multiband contacts with the same vet for bonus points, although such contacts will, as always, count toward your basic QSO total. Your bonus is the sum of the years served for the veterans you contact. For example: If you contact two veterans, and their combined years of service equals 12, that's your bonus score. For veterans: Your bonus for a contact with another veteran is the combined years of service in the QSO -- yours and the other member's. If you served 5 years and the other member served for 11, you get 16 bonus points for the contact. As with non-vets, no multibands for these bonus points. Fall is in the air, and to help usher it in, this month's Weekend Sprintathon offers bonus points for "sampling" (collecting the names of) as many different brands of keys as you can during the event. When you send your portion of the usual exchange, add a / to the end of your name and add the name of the company that manufactured your key. For some of the keys the US military used, that may be difficult. In that case, use the model: J38, J47, etc. For compound names, such as Signal Electric Corp., you can truncate or abbreviate the name. Signal Electric Corp. could be sent merely as Signal; American Morse Equipment could be sent as AME; a Grimmer Wilson key could be Grimmer. During an exchange, a name would look like this: Pete/Junker. To be clear: The bonus points go to the stations that stop by your "booth" to sample your "brew(s)." An operator with multiple keys can use each of them -- but not in the same QSO -- to boost the population of "brews." Just remember that if you work a station twice on the same band but he or she uses a different key for each, the second QSO is a dupe for all but bonus purposes. Each manufacturer is worth 50 bonus points and counts only once during the event. A key made in Germany, a Junker or Baumuster for example, is worth 100 points. Use the letters from call signs to spell out Munchen Oktoberfest, and you can tack on another 150 points. The letters from any given call can be used only once; if you need more Os that one call can supply, you need to work another station with an O in its call. Before the NCAA college football season began, the Associated Press (among others) put up its pre-season rankings. Who knows where these teams will end up at season's end. But if mascots for the 10 teams that led the AP's Top 25 end up in your log -- spelled out using the letters in the callsigns you collect during September's Weekend Sprintathon -- those mascots are worth bonus points. Here's how it works. Use the letters in the callsigns to spell out the mascot names. You can use any individual letter from a given callsign only once. For example: You contact W1EYE. You can use both Es and the Y for Buckeyes, or spread the Es out between Horned Frogs and Tigers. But you can use those letters from that call only once. Need another E? Wait for another call with an E in it. Each complete mascot name is worth 100 points, for a total of 1,000 bonus points. If the mascot name consists of two words, and you can only spell out one of them, you can claim 50 points for that mascot. If you complete all 10 mascot names, you can claim an additional 500 points for a sweep. Maximum possible bonus: 1,500 points. To help you keep track of your bonus points, Jerry Bliss, K6III, has put together a spreadsheet. You can download the *.xlsx file here. Now, who's ready for the opening coin toss? This event runs from 1200 UTC Sept. 12 to 23:59 UTC Sept. 13. Ham radio may be the only context in which the word cootie has a positive meaning: typically, a single-lever paddle an operator uses, but not with an electronic keyer. Instead, the operator must form each dit and dah as the lever moves side to side against each of the cootie's two contacts. Think "bug" with no spring for repeat dits; you have to form those yourself, in addition to the dahs. And for August's Weekend Sprintathon, operators who use cooties will be worth bonus points. For this event, we're going to bend the concept of cootie a tad. A cootie can be, well, a real cootie -- bought or homemade. If you lack one of those, you can rewire an iambic paddle so that you have to form the dits and dahs individually with your sideswiping action. Only sideswiping devices built or wired so that the operator must form each dit and dah individually, while manually controlling character spacing and weight, qualifies as a cootie for bonus purposes. If you are using a cootie, please reveal that as you give your name: yourname/co, where /co means cootie operator. If you are using anything else, please use yourname/nco, for non-cootie operator. Giving this out prevents someone from having to ask for information about your sending device. You earn 15 bonus points for each contact you make with a cootie operator. When one cootie operator works another cootie operator, each of the operators in that QSO can claim 30 points for the exchange. Multiband contacts for bonus points are permissible. Independence Day 2015 in the United States has come and gone. But we can still celebrate. July's WES, starting at 12:00 UTC July 11, aims to recognize all the major players: the 13 original colonies, plus Britain and France. For this event, the colonies include: GA, SC, NC, VA, MD, PA, DE, NJ, NY, CT, RI, MA, and NH. Maine was part Massachusetts until 1820. So for this event and this event only, either ME or MA count as MA. Update: Likewise, VA and WV at the time combined to form VA. So WV also will count as VA.
A QSO with a member based in one of the 13 colonies is worth 25 points -- only one QSO per colony counts toward the colony-bonus total. Multiband QSOs can still count for QSO points, but not for colony bonus points. Contact any station in the UK and France for a one-time bonus of 100 points each. A clean sweep of the colonies allows you to multiply your colony total by 2. Sweep the UK and France, and you can multiply the UK/France total by 2. Your bonus total is the sum of your colony points and your UK/France points. This represents a maximum possible bonus of 650 (colony sweep) + 400 (UK-France sweep) = 1050. Note: If your bonus-point total ends in anything other than a 5 or a 0, crunch the numbers again! Jerry Bliss, K6III, has prepared an Excel spreadsheet to help you track your bonus points. You can download a copy here. **With a sweep of the tricorner and deep bow to the Original 13 Colonies Event for the inspiration for this theme. One again, it's time for the annual Weekend Sprintathon Boat Anchor Regatta. If your rig has tubes, you're worth bonus points. Tubes, as in the sum of the tubes in your transceiver or transmitter-receiver pair, and power supply. And if your transmitter's frequency is set by a crystal instead of a VFO, you're potentially worth mucho bonus points. Count up the number of tubes in the rigs you are operating and attach that number to your name during your WES exchanges. If you have five tubes, send YOURNAME/5. If you are operating using crystals, add an X to the number. Send YOURNAME/5X. When the event ends, add the number of non-X points you've logged. That's a bonus subtotal. Then calculate the points you've earned for working stations using crystals. You do this by **squaring** the number of tubes for each station you've worked that was using crystals: 2X is worth 4 bonus points, 3X is worth 9 points, and so on. This means that if a station sends 14X because the operator is using a 12-tube Hammerlund receiver and a 2-tube, crystal-controlled transmitter, that's 14x14, or 196 points for that QSO. I can hear the question now: What if I have an old solid-state transmitter that is crystal controlled. Can I offer any bonus points for that? For which the answer is: 0 (no tubes) x 0 = 0. Your bonus total is the sum of non-crystal bonus points and crystal-control bonus points. If both stations in a QSO are using boat anchors, each station in the QSO may claim the sum of both stations' tubes, scoring them as outlined above. So as you operate, be sure to hunt for the folks using crystal-controlled transmitters. You may need to listen to one or two exchanges to be sure. But the nice thing about that is that unless that station has a bucketful of crystals, it won't be QSYing any time soon. If you find one, spot it on the K3UK Sked Page. And if you are operating a crystal-controlled transmitter, it would be in your interest to advertise your presence via the K3UK Sked Page. Now, please pass the PFDs. June's WES will run from 12:00 UTC Saturday, June 13, though 23:59 on Sunday, June 14. For May: Happy 100th WES! The 100th Weekend Sprintathon is coming up in May. This event will be a different in two ways. 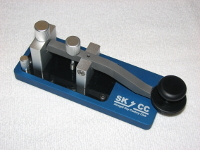 To commemorate the event, the club will raffle off two LNR Precision SKCC straight keys -- one to a US SKCC station and the other to a DX SKCC station. The "price" for entry into the raffle? Your participation, at whatever level you can muster between 1200 UTC on May 9 and 2359 UTC on May 10. Each participating SKCC member*** will automatically be entered for the drawing. Shipping is on us. The DX winner? Shipping also is on us, but customs duties, if any, are on you. For the purposes of the drawing, we'll be departing from the typical DXCC listings by including Alaska, Hawaii, and US possessions or territories as "US." Each participating member will be entered into the proper category and assigned a number: 1 through the maximum number of participants in each of the two raffle categories. We'll seed a computer's random-number generator and let it "tumble the cage" for us. The members whose numbers the computer picks win the keys. ***You must submit your results using the event's submissions page to qualify. The For this raffle, current members of the SKCC board and members of the club's support team, as listed on the club website, are ineligible. From 0000-2359 UTC May 9, the US Islands Award Program is holding its first "One-Day Getaway." Hams will be operating portable and mobile stations from fresh- and salt-water islands around the US. Both activators and chasers will be trying to bag islands for the program's awards. Any SKCC member operating from a qualifying island for three hours or longer during the overlap in our two events (1200-2359 UTC May 9) will be worth major bonus points. If you are activating and island, please try to post your island and the approximate times you'll be operating from it on the SKCC's Yahoo email list. The islands from which you operate must meet the US Islands Program criteria, as described here. If you are activating an island but the island doesn't appear on the USI Program's official list, you can have the fun of garnering the QSOs needed to make it official. You can see the list here. Note that an island can be connected to the mainland by a bridge or narrow causeway, as long as the island is the right size and far enough away from the shore (no peninsulas need apply). Be sure to look over the US Islands Program's list of already-qualified islands. You may find they are closer and easier to reach than you think. WES participants who work SKCC-activated islands will earn a one-time bonus of 500 points per island -- one time as in, once during the WES. Similarly, SKCC "island activating" stations conducting an SKCC-island-to-SKCC-island QSO can claim 750 points apiece, but only once per island. The typical CQ for island activators is CQ Islands. SKCC members who activate an island should call CQ WES/USI. If you are an activator, feel free to post a screenshot of an APRS map showing your location or just a photo of your set-up so that all may marvel at your seamanship, lakemanship, or rivermanship skills. Remember to give out your SKCC number as well as the island number during your QSOs, which for WES purposes must meet the usual SKCC requirements for valid exchanges and sending devices. SKCC members operating from islands should respond to all stations wanting to contact the island, not just SKCC stations. USI groupies will be just as eager to snag your island as SKCCers will be to snag the bonus points (and, perhaps, islands toward their own USI awards). This does imply that for members whose schedules don't allow them to operate May 9, there will be no opportunity to earn bonus points that month. I hope you won't let that dissuade you from participating in May's WES. The key raffle still dangles in front of you, as does the opportunity to wrack up additional QSOs for SKCC achievement awards. And for those intrigued by the prospect of a day-long island getaway, don't forget the sunscreen! This month marks the 155th anniversary of the first Pony Express runs on April 3, 1860 -- one westbound and one eastbound. To mark this event, two short messages will be sent out, each originating with an anonymous volunteer. To earn bonus points, your task is to collect both messages though on-air exchanges between you and other participants. Each message will carry a two letter code noting its direction: WB for westbound and EB for eastbound. The body of each message will be three random words long, with no punctuation. Once the event ends, I'll post the messages on the WES's main page so you can see how you did. And yes, they're all in the dictionary! For each correct message, you will earn 1,000 bonus points -- 2,000 total points possible. The implication, of course, is that you will be sharing the messages as well as receiving them. So once you have finished the basic WES exchange, the station originating the QSO should either ask the other station if they have messages or if they need messages: A simple "hve msgs?" or "need msgs?" will work. The other station should reply accordingly: "Hv WB" (or EB), "Need WB" (or EB) , or "None" if you haven't copied any at all yet or don't need any. Even if you have or need both, the exchange should involve no more than one message each way; you may not copy both EB and WB messages from the same SKCC member during the event, even if that station has both messages. If neither station in a QSO has or needs the messages, feel free to wrap up the QSO and move on. These messages will be short, so requests for fills may be few. But please respect such requests if they come your way. Yes, this will slow the pace of the event a bit. On the other hand, no saddle sores! And lots of opportunities to send for clarity as well as for QSO points. Now, which saddlebag is holding the carrots? The event runs from 1200 UTC Saturday, April 11 to 2359 UTC Sunday, April 12. This month, we're doing a mean mess o' flea-power flickin' with QRP/QRPp stations as the bonus-point targets. QRO participants can earn 10 points per contact with a station running from 2 to 5 watts (QRP). A station running 1 watt or less (QRPp) is worth 20 points per contact. Each station in a QRP/QRPp x 2 QSO earns the sum of both stations' bonus values: A QRP x 2 is worth 20 points for each station; a QRP - QRPp QSO is worth 30 points to each; a QRPp x 2 is worth 40 points to each station in the QSO. If you are running QRP/QRPp, please send your power level after your SKCC number during your exchanges and identify yourself as a QRP/QRPp station either during your CQ, as in CQ WES QRP, or after your call, as in N1ABS/QRP. Multiband QSOs with a given QRP or QRPp station are permitted for bonus points. The event runs from 1200 UTC Saturday, March 7 to 2359 UTC Sunday, March 8. And remember, US jurisdictions that recognize daylight saving time switch over to it in the wee hours of March 8. This month, we're "traveling" the Lincoln Highway -- the first transcontinental highway, although in 1913, it was a bit rough. The coast-to-coast route that takes you through 14 states (auxiliary routes excluded). For background on the highway, see www.lincolnhighwayassoc.org. You have two independent opportunities for bonus points. Give yourself 20 points for each state you contact among the list above. If you sweep the states, give yourself the 14-state total (280 points) plus 120 points for the sweep. The second bonus, 200 points, comes if you can use the letters in the call signs of the stations you work to spell out Lincoln Highway. You can use as many letters as needed in a given call, but only once from that call. When you run out of a letter, say the letter L and you need it again, you'll have to wait for another fresh call with that letter. If a call has two Ls, use 'em both. Your total bonus score will equal the bonus points from the states you've "visited" plus the bonus for spelling Lincoln Highway. The maximum possible bonus is 600 points. Thanks to Roger Land, KC4HCH, for the inspiration for this theme! K3Y this month celebrates the club's anniversary, so this month, the club's Weekend Sprintathon celebrates those who founded the club or joined it during its inaugural year, 2006. Any member whose number is 2545 or lower is worth a one-time bonus of 25 points, in addition to any C, T, or S attached to the number. For example, a QSO with W7GVE, 729T, would be worth 25 bonus points, in addition to the T you can claim on the number. And since the Sprintathon is overlapping the K3Y celebration, do we have a deal for K3Y stations! The time you spend operating as a K3Y station during the WES counts toward the Sprintathon's 24-hour operating limit. But if you contact a station during WES as K3Y/#, you may contact the same station again when you return to "civilian" status and claim its SPC multiplier for both K3Y and civilian QSOs. For instance, if K3Y/2 contacts N1ABS and later, as K2DUH, contacts N1ABS again, that operator can count a MA for each contact. In such cases, you can count only the SPC multiplier twice. Additional QSOs with N1ABS on other bands would count for QSO points only. This double counting is available only to stations taking shifts as K3Y/# during the Sprintathon. Many thanks to those first 2545 members who poured the foundation for SKCC! And many thanks to the volunteers this year serving as K3Y stations! January's Weekend Sprintathon runs from 12:00 UTC Jan. 10 to 23:59 UTC Jan. 11. What's a Scrooge key? One you build yourself from whatever is in your junk box or from dirt-cheap components -- no kits. After all, a penny saved is one you can use to help family and friends enjoy the holidays. Keys must be made fresh for this event, not dredged up from years past. If you use your Scrooge key for anywhere from one QSO to two hours hour of operation, give yourself 100 bonus points. If you operate for more than two hours with your Scrooge key, give yourself 250 bonus points. If you operate for the entire event with your tightwad special, give yourself 400 bonus points. In addition, each SKCC member you work whose number has no initial after it on the club roster is worth 25 points per QSO, with multi-band QSOs allowed for this aspect of December's bonus points. If you have no initial linked to your number and you work another station with no initial, each of you can claim 50 bonus points for that QSO. As usual, a unique SPC can be claimed only once during the event. Your bonus total = Scrooge-key bonus (if any) + one-way, no initial QSOs (or 2-way, no initial QSOs). For example: You used a Scrooge key for 90 minutes, you logged 5 QSOs with initial-free members, and you are a C, T, or S. Your total = 100 + 125 = 225. If you are a member with no initial after your number and you used your Scrooge key for 90 minutes, that total would be 100 + 250 = 350. If your bonus score ends in anything other than a 0 or 5, recalculate. The event runs from 1200 UTC Dec. 13 to 2359 UTC Dec. 14. Now, Mr. Cratchit, about that extra coal you wanted for the stove? Bah! Humbug! Call it Veterans Day, Remembrance Day, or Poppy Day, Nov. 11 holds a special place in the pantheon of annual national holidays -- a time to honor all of those who have served in their countries' armed forces. At least 20 countries around the world celebrate the day. This month's Weekend Sprintathon is designed to do so as well. For this event, a veteran is someone who has served in uniform: Army, Air Force, Navy, Marines, and Coast Guard or its equivalent, as well as reservists or members of the National Guard. Because the day also commemorates the end of World War 1, any SKCC member outside the United States who has served in his or her country's military also is invited to use the /V# designation as well. For non-vets: You earn a bonus for each unique veteran contacted. Only one QSO per veteran-member counts; no multiband contacts with the same vet for bonus points, although such contacts will, as always, count toward your basic QSO total. Your bonus is the sum of the years served for the veterans you contact. For example: If you contact two veterans, and their combined years of service equals 12, that's your bonus score. The event runs from 12:00 UTC Nov. 8 to 23:59 UTC Nov. 9. IMPORTANT NOTE:This weekend, we are sharing "event space" with a group of former Western Electric employees who are hams. They also are holding part of their annual operating event today -- a CW/digital portion that will run from 1900 to 2300 UTC Nov. 8. For information, see: http://cqwe.cboh.org/. We send CQ WES; they send CQ WE. So listen carefully to those CQs, and if you want to respond to a CQ WE, be sure you know the exchange the other op is looking for! It's described on the event's web page, at the above link. Baseball playoffs are in full swing, where 10 teams are being winnowed down to two for the World Series. During this month's WES, you can earn bonus points by using use letters in the calls you log to spell out the names of the contending teams. Use as many letters as you can from each call you log, but you can pluck a letter from any single call sign only once. But wait! There's more! You can earn additional points by collecting the jersey numbers for the top-of-the-rotation pitcher from each playoff team, using the numbers in the calls you log -- each call's number can be used only once. Each complete team name is worth 25 points. Each complete jersey number is worth 15 points. Our umpire for this game will be Bill, N7MFB, 10772T. He will roam the playing field and is worth 200 points per band. However, he will not be using the sked page, although if you work him, you can spot him on the page. And no attempts to set up a QSO via email are allowed. Your bonus total = name + jersey number + umpire points. For September WES: Hit the Road, Jack! Summer is waning, and along with it the chance to enjoy the great outdoors, at least in shirt sleeves. This month, you can earn bonus points two ways: first, by taking your station on the road -- you pick the distance, but your operating location has to be beyond your back deck, driveway, or front curb; second, by contacting stations that have hit the road. If your station fits into a fanny pack or day pack, that's great. If it's tucked under the dash of your 4x4, that's great too. Find a beautiful spot, hang an antenna, and enjoy! And don't forget to enjoy the chats with the folks who may wander up and ask about your activity. Stations going mobile must stay out for at least three consecutive hours of the operator's choosing during the Sprintathon. Please identify yourself for other Sprintathon participants by including at the end of your call a /#, where # is the number of the call region (including your own) from which you are operating. Stations hitting the road will earn 1,000 bonus points for making the effort. All stations will earn 25 bonus points for each mobile station worked -- multiband QSOs with the same mobile station can be counted for bonus points. It's summer, and if you didn't or don't surf, you've still probably heard the music. This month, earn bonus points by using the letters in the call signs you log to spell out the names of the 15 surfing sites The Beach Boys list in "Surfing USA." (OK, so they mention one beach in Australia). Each fully spelled name is worth 25 points; no partials. You can apply letters in a call to any surfing site's name until that call's letters are used up, but you can use each letter from a given call only once. But wait, there's more! This month, we're dusting off the club call, K9SKC, for bonus purposes. Karen, W4KRN, will use the call as the special sprint station. Contacts with K9SKC are worth 25 points each, with multiband contacts permitted, but only one contact per band. Your bonus score equals your surfin' site total (the total will end in a 0 or 5) plus your special sprint station total. That means the maximum points you can earn is 375 + 175 = 550 points -- 160-6m, no WARC bands, unless you're really skilled and snag Karen on 2 meters CW as well (no repeaters). Then you're up to 575. The event runs from 1200 UTC Saturday, Aug. 9 through 2359 UTC Aug. 10. Hey, dudes and dudettes: Outside! Independence Day 2014 in the United States has come and gone. But we can still celebrate. July's WES, starting at 12:00 UTC July 12, aims to recognize all the major players: the 13 original colonies, plus Britain and France. For this event, the colonies include: GA, SC, NC, VA, MD, PA, DE, NJ, NY, CT, RI, MA, and NH. Maine was part Massachusetts until 1820. So for this event and this event only, either ME or MA count as MA. A QSO with a member based in one of the 13 colonies is worth 25 points -- only one QSO per colony counts toward the colony-bonus total. Multiband QSOs can still count for QSO points, but not for colonybonus points. Contact any station in the UK and France for a one-time bonus of 125 points each. A clean sweep of the colonies allows you to multiply your colony total by 2 (no multi-band sweeps). Sweep the UK and France, and you can multiply the UK/France total by 2. Your bonus total is the sum of your colony points and your UK/France points. This represents a maximum possible bonus of 650 (colony sweep) + 500 (UK-France sweep) = 1150. Note: If your bonus-point total ends in anything other than a 5 or a 0, crunch the numbers again! **A big tip of the tri-corner to the Original 13 Colonies Special Event for the inspiration for this one. For June WES: what do you do with an old boat anchor? ...the number of tubes in your rig, including any in the power supply, are the bonus points others will earn for working you. Just affix the number of tubes to your name during your exchanges, thusly: Pete/4. If you are hunting boat-anchor stations, please add 0 to your name so no one has to bug you for a tube number. You bonus total equals boat-anchor points (100 or 50), if any, plus the total number of tubes you "collect" as you work boat-anchor stations. You may work a BA station on multiple bands for bonus credit on each band, but only once per band. Now, where did I put that anchor chain? The info's been up for months (see below), and now it's here: The assault of the one-tube wonders. Members who have put together one-tube transmitters since the first of the year and who use them during this weekend's WES will be worth bonus points. If you are using one of the one-tube rigs, please tout this by following your name with a /T1 during exchanges, as in Pete/T1. Each unique T1 contact will be worth 50 bonus points, with multi-band contacts permitted. T1 stations earn 100 points for each unique T1-T1 contact, multiband allowed. A few operating suggestions are in order, because most if not all of these transmitters will be rockbound and will typically be running a few watts of output. -- Bonus stations are strongly encouraged to use the K3UK Sked page to announce their frequencies. -- In cases where more than one crystal-controlled transmitter is using the same frequency, be sure to give others a chance. Communicate via the sked page's personal-message function if you need to in order to hand off the frequency from one crystal-controlled station to another. Be nice; share. -- Bonus stations may want to consider operating split, with your receiving frequency 1 or 2 Khz above or below your transmit frequency, +/- for QRM. Make like a rare DX station! If you do, be sure to post the split on the sked page as well. -- For us VFO types, as you settle on a frequency for calling your own CQ's, please check the sked page for bonus station frequencies, even if you have done due diligence listening before you start sending. Weak bonus station + propagation can = unintentional QRM. -- Finally, since these stations are running low power, contacts with them qualify for the club's QRP awards as long as your exchange contains all of the information those awards require. Ladies and gentlemen, warm up your 6L6s! Note: The theme has been expanded to those to bult rigs but not on conjunction with the challenge below. For May, anyone putting on the air a one-tube transmitter built as part of a challenge conceived by Curt Nixon, KU8L, SKCC 5380T, and sweetened by Cory Sickles, WA3UVV, SKCC 5863, you and your ham band-warmers will become an integral part of the bonus scheme for that month's Weekend Sprintathon. "If you'd like to join in the fun of building such a transmitter and the possibility of showing off your handiwork to a larger audience, I'm willing to devote space in my May 2014 'Off the Air' column in CQ Plus (formerly WRO) that discusses the more 'interesting' rigs, pictures and -- of course -- talks more about SKCC. If there are enough suitable submissions, I might even extend this to a second column. "Many of us built and used such rigs during our Novice experience and continued to, long after that. Others are discovering the simplicity and sheer fun of QSOs accomplished by virtue of a glowing glass envelope and empty-state technology. If you are new to this old tech, perhaps a discussion with more-senior members of your radio club are in order - to Elmer you into this project. "In addition, Josh Benson was laying out a regen[erative] receiver, as posted in one of his comments. Here too, I'd like to encourage such designs and feature them similarly. Again, let's keep this 'thermatron oriented' and leave solid state designs for a later time. "So, if you'd like to accept the challenge, please submit a brief write-up, well-focused and lit pictures (possibly with your favorite key in the shot), plus links to any YouTube videos (steady camera shots, please) you may have - no later than 17:00 EST on February 28th. "I hope to see an enthusiastic and wide-ranging set of responses. Please email them to WA3UVV (at) gmail (dot) com. TNX!" So there you have it. A chance to hearken back to the days when scrounging parts and repurposing them to get on the air was common. If you find useful sources for parts, please share them with the group. For background on CQ Plus, see http://www.eham.net/articles/31428. Potential publicity in a major on-line ham-radio publication, plus bonus points for using the rigs? What's not to like?? This month, we're acknowledging members who also have been elected to the ARRL's A1 Operators Club. At last count, the SKCC has 552 A1 Ops among its ranks. For information on the A1 Operators program, you can read all about it here. If you are an A1 Op, please add /A1 to your name during your WES exchanges. Each QSO between an SKCC member who is an A1 Op and another participant who is not an A1 Op is worth 5 bonus points to the member who isn't an A1 Op. If two A1 Ops exchange information, the QSO is worth 10 bonus points to each op. Multiband contacts with the same A1 Op may be counted for added bonus points. And thank you, Urb, W1UL, for the theme idea. A reminder: You need to calculate your own bonus total. The submissions page does not do that for you because the bonus scheme varies with the monthly theme. If you contact 3 A1 Ops, don't put 3 in the bonus field on the submissions page. Put 15. If your bonus total ends in anything other that 0 or 5, follow the lead of that female voice on your car's GPS: "Recalculating." Use letters from the call signs you log during WES to spell out as many of these counties as you can. A letter from each call sign can be used only once. Each county is worth 25 bonus points for a maximum of 200 points. Only fully spelled counties count. This next step is all or nothing: Use the numbers from the calls as well to build the years in the list. Again, you can use the number from a call sign only once. Build all eight years and match them with all eight counties-corporate you've built from call-sign letters and you nail a pot of gold (PoG): 200 bonus points added to the 200 you earned for building all eight county names. You must nail all eight counties before you can try to apply the numbers in call signs to the years. And you earn the PoG only if you build all eight years. Thus, the maximum number of bonus points this time around is 400, and any bonus you enter on the submission page must end in a 5 or 0. If your bonus total ends in any other number, you've shortchanged yourself! For February, let's welcome the SKCC newcomers! If my third-grade math still serves, we added 230 members to the SKCC ranks in January. So for the next WES, we'll reprise a bit of December, but with an exclusive focus on our newest members. For most members, a QSO with a member sporting an SKCC number of 11576 or higher is worth 25 bonus points, with multiband contacts permissible, but only once per band. For the newcomers, if you contact another member whose number falls within the range above, you can count the bonus points twice. For instance, if member 11576 contacts member 11577, each station in that exchange can claim 50 bonus points for the exchange. Pull the same feat off on a second band, and you can claim another 50 bonus points, again only once per band. February's Weekend Sprintathon runs from 12:00 UTC Feb. 8 to 23:59 UTC Feb. 9. And since the Sprintathon is overlapping the K3Y celebration, do we have a deal for K3Y stations! The time you spend operating as a K3Y station during the WES counts toward the Sprintathon's 24-hour operating limit. But if you contact a station during WES as K3Y/#, you may contact the same station again during the event as a non-K3Y station and claim its SPC multiplier for both QSOs. For instance, if K3Y/2 contacts N1ABS and later, as K2DUH, contacts N1ABS again, that operator can count one MA for each contact. You can count only the SPC mulitplier twice. Additional QSOs with N1ABS would count for QSO points only. This double counting is available only to stations taking shifts as K3Y/# during the Sprintathon. January's Weekend Sprintathon runs from 12:00 UTC Jan. 11 to 23:59 UTC Jan. 12. It's the holiday season, you'll be springing for gifts, but you're hankering for a new key? Build one and use it for bonus points during December's Weekend Sprintathon. To qualify for bonus points, the key must be built fresh for this event from scratch -- no kits. If you build a key and use it for at least one QSO or for up to two hours, give yourself 100 bonus points. If you use the key longer than two hours, give yourself 300 bonus points. If you use the key for the whole Sprintathon, give yourself 400 bonus points. In addition, let's give new members a real workout this month. Every QSO you make with a member who has no initial after his or her SKCC number (as determined by the club roster) will be worth 25 points each; multiband contacts with the same member are permitted. This should prepare them to join in the fun as special-event stations when K3Y rolls around in January! This means your bonus total combines the points you earn for using your newly minted homebrew key with the bonus points you earn for contacting initial-free members. And as you tote up your bonuses, if the number ends in anything other than a 5 or 0, check your arithmetic. The event runs from 12:00 UTC Dec. 7 to 23:59 UTC Dec. 8. The event runs from 12:00 UTC Nov. 9 to 23:59 UTC Nov. 10. For Oct. 12-13: Playing for October! Here in the US, major-league baseball playoffs are in full swing. During this month's WES, you're invited to step up to the plate for bonus points. Like the sandlot days of yore, we need four bases: Maine, Washington state, southern California, and Florida. For the purposes of this event, southern California is defined as all of the state below the northern borders of San Luis Obispo, Kern, and San Bernardino counties. Reach any of those bases, in any order, on any combination of non-WARC bands, and you earn 50 points per base. For a home run (all four bases on any combination of bands), add another 100 points to the total. That's a maximum of 300 bonus points for a home run: 200 for all bags, plus the 100-point home-run bonus. Finally, as you log calls, use the letters to spell out the complete name: Carl Yazstrzemski for an additional 100 bonus points. With fall on our doorstep, it's a good time to leaf-peep SKCC style. This month, you can snag bonus points for contacting Canadian provinces and territories, with extra points if the station you contact is in a provincial capital. In addition to bonus points, these contacts also count toward the club's Canadian Maple Award, with its many-hued levels of achievement. For information on the award, visit its Rules page, listed in in the navigation column at left under Awards. All of the bonus points for Canadian contacts are one-time bonuses; as in once during the Weekend Sprintathon. A QSO with a station in a provincial or territorial capital counts for the province or territory, as well as for the capital. Provinces: Alberta, British Columbia, Manitoba, New Brunswick, Newfoundland, Nova Scotia, Ontario, Prince Edward Island, Quebec, and Saskatchewan. One-time bonus of 10 points each; plus 100-point bonus for a sweep. Capitals: Halifax, St. John's, Quebec City, Charlottetown, Ottawa, Winnipeg, Regina, Edmonton, Victoria, Fredericton. One-time bonus of 20 points per capital; plus 200 points for a sweep. Territories: Northwest Territories, Nunavut, Yukon. One-time bonus of 30 points each; plus 90 points for a sweep. Capitals: Yellowknife, Iquluit, Whitehorse. One-time bonus of 40 points each; plus 120 points for a sweep. Others: St. Paul Island and Sable Island. One-time bonus of 50 points each; plus 100 points for a sweep. For capital points, the station must be within the capital's city limits, not in a suburb. If a Canadian member living outside a capital wishes to operate portable in the capital, perhaps in a park, that's cool. Be sure to identify the city during the exchange; otherwise a station's location as listed in the club roster will determine QTH. The event runs from 12:00 UTC 9/7 to 23:59 UTC 9/8. A big tip of the leaf rake to Roger, KC4HCH, SKCC 7688T, for the theme! No, not those cooties! The Morse code types! Any participant using a sideswiper (a.k.a cootie) key is worth a bonus of 10 points per band to participants who contact them. How will you know who is using a cootie? Cootie operators should identify themselves with a /co after their names during the standard WES exchange. Those who are using anything else, please add /nc (no cootie) to your name so the other operators won't have to ask if you're using a cootie. One goal here is to encourage hams who haven't tried a sideswiper to give it a shot. Typically, these are single-lever paddles. But for this event, you will be allowed to use an iambic paddle -- if you rewire it to serve as a cootie. Run a jumper between or otherwise connect the dit terminal to the dah terminal and you're good to go. You, the operator, must form and determine the length of characters, as well as spacing. No electronic-keying circuits may be used. And for those of you who have taken the time over the years to build a cootie from scratch and are using it, or you throw one together quickly for this event, take a one-time bonus of 50 points in addition to the bonus points you earn by working other cootie owners. Cooties -- they're not just for eeyew anymore! Independence Day 2013 in the United States has come and gone. But we can still celebrate. July's WES, starting at 12:00 UTC July 13, aims to recognize all the major players: the 13 original colonies, plus Britain and France. A clean sweep of the colonies allows you to multiply your colony total by 2 (no multi-band sweeps). Sweep the UK and France, and you can multiply that total by 2. It's time once again to turn vintage rigs into bonus points for the SKCC's Weekend Sprintathon this month. The event runs from 1200 UTC June 8 to 2359 June 9. If you are using an all-tube transmitter, receiver, "twins," or transceiver, give yourself 100 bonus points. Include any tubes in an outboard power supply if your radios use them. If you are using a hybrid radio, mixing tube and solid-state circuits, give yourself 50 points. Also, be sure to count the number of tubes in the radios you are using, including any tubes in an outboard power supply. For all participants, during your exchange please add the following after you send your SKCC number: a T and the number of tubes your gear is using. If your gear is all solid state, send T0. For boat-anchor users, your total boat-anchor bonus is either 100 or 50, plus the total tube count from all of your QSOs. For everyone else, your boat-anchor bonus is your total tube count from all QSOs. Note that if you work the same station on multiple bands, you may include the tube count for each QSO with that station. Tube rigs are not just for anchoring skiffs or canoes anymore! The SKCC's Weekend Sprintathon is coming up this weekend. And for this one, grasshopper(s), seek balance between the yin of CQ and the yang of S and P in your quest for bonus points. During your contacts, note which QSOs come from you calling CQ and which come from you searching and pouncing on CQing stations. When you're finished, total up each category. To determine your bonus points, divide the smaller number by the larger, then multiply that by your QSO total. Round off the result to the nearest whole number. That becomes your bonus total. For instance, I contact 15 stations (busy weekend). Five contacts result from me calling CQ; 10 were S and P contacts. I divide the smaller by the larger (5/10) and get 0.50. When I multiply that by my QSO total, I get 15 x 0.50 = 7.5 bonus points. Scoring gets really crazy with fractions, so round off to the nearest whole number; 7.5 becomes 8. Note that the closer you come to a balance between CQs and S and Ps, the higher your bonus total becomes given your QSO count. And an early heads-up: June's theme will be a perennial favorite -- boat anchors, which means tubes somewhere in the transceiver, transmitter, receiver, or power supply. P.S. Anyone remember that two-tube, two-band, xtal-controlled transmitter on a square cake pan that appeared in Electronics Illustrated in September 1964 -- "The Scrounger"? Ten watts input for $5. An 80-meter xtal would allow you to operate on 80m and 40m. This month marks the 210th anniversary of the Louisiana Purchase. With the stroke of a pen and cool $15 million to Napoleon Bonaparte (in 1803 dollars), the size of a young US virtually doubled. Nice going, Tom! To mark the anniversary, the green-eyeshade types at WES headquarters decided to award bonus points for QSOs with members from 15 states that grew -- whole or in part -- from that real-estate deal will be worth bonus points. QSOs with members in France, Alberta, and Saskatchewan also will earn you bonus points. ...will be worth 10 points apiece per band. But only one QSO with that state. As for France and the two Canadian provinces, you can earn another 10 points per band for a contact each of these three entities. That's 180 possible Louisiana Purchase bonus points per band, propagation willing. And note the word "members." We welcome non-members as participants in the event. But you may claim a Louisiana Purchase bonus points only for QSOs with members. Finally, if you pull off a sweep of all 18 entities, give yourself a 180-point sweep bonus. The event runs from 12:00 UTC April 13 to 23:59 UTC April 14. P.S. A tip of the shrimp etouffee bowl to Rick, N5RB, for the idea! You're invited to throttle back the power for March's Weekend Sprintathon, coming up March 9. And this month, it looks like New England is in the clear for blizzards for next weekend (insert sound of knuckles rapping on wood here). So W1AW will be the event's special bonus station. W1AW is worth a one-time bonus of 500 points. [Clarified] Anyone operating QRP or QRPp throughout the event also is worth bonus points to all participants: 5 points per QSO per band for anyone contacting a station running 5 watts or less (QRP); 10 points per band per QSO for working anyone contacting a station running 1 watt or less (QRPp). If you are taking part in one of these Sprintathons for the first time and are not a member, replace the SKCC number (4853T in the example above) with the word none. Note: When you submit your scores, you needn't use /QRP or /QRPp as part of your call on the submission form. You will automatically be listed in the QRP or QRPp section on the results page when you enter the power level you used. Again, the event runs from 1200 UTC March 9 to 23:59 UTC March 10. During that period, you may operate for no more than 24 hours. Let the Peanut Whistle chorus begin! With Valentine's Day coming up, let's tip our caps to romance during February's Weekend Sprintathon, which will run from 1200 UTC Feb. 9 through 23:59 UTC Feb. 10. Whether you are of the XY or YY chromosome set, when you send your name during the normal exchange, follow it with a / and the number of years you have been married or have enjoyed the companionship of your current main squeeze. Use 1 for a year or less. Your bonus total is the sum of the years you gather up during your QSOs. You may use a member's year designation only once for bonus points, even though you contact that member on several bands for QSO points. In addition, fully spell out Valentines Day with the letters from the call signs you gather in your log for an additional 50 points. Oh, yes: No flowers or candy were harmed in producing this event. With January's Weekend Sprintathon coming up next week, let's toast the Ts, with an additional tip of the hat to K3Y stations operating during the Sprintathon. For non-K3Y stations, Ts you work are worth bonus points, in addition to the usual multipliers you receive for working Cs and Ts. The point system is based on the Tx# endorsement a Tribune has. As part of the QSO exchange, Tribunes are asked to add T# as a separate part of the usual exchange, using the numerical value assigned to the endorsement on their basic T award -- do not use band endorsements. For instance, if KA8OOM has a Tx5 endorsement on his or her basic award, the usual exchange should end with SKCC number, 20000T, and T5, for the endorsement. If you are a Tribune but haven't snagged any endorsements yet, you are still worth a bonus point, T1. All participants' bonus totals equal the sum of all the T numbers. Note: As with the use of Cs or Ts as part of your basic WES scores, you may claim a member's endorsement number only once during the event. A tap of the straight key to Randy, KX1NH, for the idea. For K3Y stations operating during the Sprintathon, you may take credit for S/P/Cs you collect as K3Y/# and for the ones you collect as a "civilian" station -- even if some are duplicates. For instance, if you work MA as a "civilian" operator during WES, then again as K3Y/8, you may count both MAs toward your S/P/C total. If you contact more than one MA as K3Y/#, you may include only one of them. You also may claim the Tx# bonus points you collect, following the approach that applies to the rest of the participants -- no duplicates. That twist was based on a suggestion from Drew, AF2Z. During the Sprintathon, you may contact a K3Y/# station more than once and count it toward your Cs and Ts -- as long as each QSO is with a different SKCC member using that call. So keep track of SKCC numbers. That's your key to telling one K3Y/5 from another. To recap: For all participants, the bonus is the sum of the T endorsement numbers you collect from each unique Tribune. For K3Y stations, you are entitled to take the T bonus, plus the unique S/P/Cs you collect when operating as K3Y. Between K3Y, WES, and the North American QSO Party CW event this weekend, the bands should be singing with dits and dahs! Finally, (will this ever end??) response to extending the window for participating in the Weekend Sprintathons was overwhelmingly positive, based on comments in last month's results-page comment section as well as here on the list. But that could have been a fluke. So we'll try it again to see if the enthusiasm holds. You may operate for up to 24 hours of your choosing within a 36-hour window beginning at 1200 UTC Jan. 12. December's Weekend Sprintathon is putting a spotlight on homebrew keys -- straight keys, cooties, and if you're brave, bugs. No kits, just a freshly made key built from whatever you have in your junk box or garage. Now, not everyone has the skills of a master machinist. Some keys may, shall we say, return to a cluster of parts after the first few QSOs. No worries. Anyone fielding a freshly minted homemade key for up to two hours during the event (that's one QSO through two hours) gets 100 bonus points. Anyone fielding a freshly minted homemade key for more than two hours gets 200. Anyone who operates for the full event with a freshly minted homebrew key gets 500 points. Hey, mechanical endurance (or is that operator endurance?) has to count for something. A reminder: This month's WES begins at 12:00 UTC Saturday and runs through 23:59 UTC Sunday. Participants can operate for up to 24 hours -- any 24 they choose -- within the 36-hour window. And please upload a snapshot of your homebrew key when you submit your results. I will be copying them off the page for a special WES page on homebrew keys I'll be putting together after the event. We need to start recording and archiving these mechanical wonders! Call it Veterans Day, Remembrance Day, or Poppy Day, Nov. 11 holds a special place in the pantheon of annual national holidays -- a time to honor all of those who have served in their countries' armed forces. At least 20 countries around the world celebrate the day. This months' Weekend Sprintathon, which runs Nov. 11 from 00:00 to 23:59 UTC, is designed to do so as well. Veterans are asked to add a /V to their names during the normal exchange. In addition, they are asked to add the number of years served to the V. If you served for four years, you would send /V4 at the end of your name. All others are asked to send a /C for civilian. For this event, a veteran is someone who has served in uniform; Army, Air Force, Navy, Marines, and Coast Guard or its equivalent, as well as reservists or members of the National Guard. Because this is in many ways a global holiday commemorating the end of World War 1, any SKCC member outside the United States who has served in his or her country's military also is invited to use the /V# designation as well. For civilians: You earn a bonus for each unique veteran contacted. Only one QSO per veteran-member counts; no multiband contacts with the same vet -- for bonus points, although such contacts will, as always, count toward your basic QSO total. You bonus is the sum of the years served for the veterans you contact. For example: If you contact two veterans, and their combined years of service equals 12, that's your bonus score. For veterans: Your bonus for a contact with another veteran is the combined years of service in the QSO -- yours and the other member's. If you served 5 years and the other member served for 11, you get 16 bonus points for the contact. As with civilians, no multibands for these bonus points. October's coming, bringing the tricks and treats of Halloween. And what could be more gross than a large swarm of bugs crawling over the airwaves? Ah, the hideous species: Vibroplex, Lionel, Les Logan, McElroy, SpeedX, and their ilk. Earlier this year, several of you took the plunge, picked up some bugs off of eBay, and gave them a try. So, for this WES, get practicing, 'cause your bug is worth bonus points. Each operator using a bug for October's WES is worth a one-time bonus of 10 points to those who work him or her. Bug-to-bug contacts are worth 20 points for each operator in the exchange. Bug users should identify themselves with a /bug after their calls, as in W1PNS/bug. In addition, use the calls of the stations you work to spell out as many of the manufacturers listed above as you can. Each complete name is worth 10 points. Sweep the list and add another 50. For instance, four names is worth 40 points; all five are worth 100 (10 points per complete name, plus the 50-point "sweep" bonus). Finally, K8XXX, the Eastern Michigan Contest Club, SKCC #8577, will be running as a bonus station, worth 50 points per band. Your bonus total is the sum of the bug bonus points plus the total points for spelling out the manufacturers' names plus your bonus points for contacting K8XXX. The tap, tap, tap you hear is the sound of "Wanted/Reward" posters going up on trees and telegraph poles for the Missouri Outlaws. Y'all probably have seen some of their ornery taunts in the comments section of past Weekend Sprintathons. Well, it's high time we round 'em up. Especially their ringleaders, Slim (no kidding, his real nom de ham radio! ), WA0BGV, Mark, KI0I, and Bill, N0UMP. These bandits are the core group, and all call Cass County, MO, their home -- a county frequented back in the day by bandits, including the likes of Jesse and Frank James and the Dalton brothers. But remember, while these three amigos are at the top of the Most Wanted list, you're hunting for anyone with a Missouri QTH! From a state like that, they'z all outlaws! In addition to the usual scoring scheme for a Weekend Sprintathon, here's the bonus-point bounty for you bounty hunters. Slim, Mark, and Bill, are worth 25 points each per band. Any other Missouri varmint you nab is worth 10 points each per band. If you hear 'em, whether you work 'em or not, post it to the K3UK spotting page so we can try to surround them. But they're a shifty bunch. Don't be surprised if one of them ambushes you while you call CQ WES. And if you do spot them on the sked page, don't expect them to hang around that frequency too long. I hear tell they don't relish being the guests of honor at a necktie party! So when 0000 UTC arrives this Sunday, mount up and give chase. You've got until 2359 UTC Sunday to nab as many as you can. The world will be a safer place for your hard riding and straight-key shootin'! P.S. A tip 'o the ten-gallon hat to Mitch, WD0ECO, for the theme suggestion! Yep, it's a good time to celebrate our club's Elmers. These are folks who volunteer their time on the air to help newcomers overcome their CW jitters. And they encourage more-experienced hams to achieve higher levels of good operating practice. So, this month, Elmers are the hot item for bonus points, with a thank-you-Elmers twist (and Elmers, we have a list; we know who you are). SKCC Elmers are asked to send a /e after their names during exchanges. Those who work Elmers -- and yes, you can use the roster of Elmers on the SKCC Elmer page to identify them -- are to send a /tue after their names for "thank you Elmer." If I'm an Elmer, I send Pete/e as part of my exchange. If I'm working an Elmer, I send Pete/tue during my half of the exchange. You can find the Elmer page here. Each Elmer a member works is worth 5 bonus points, in addition to the usual QSO point. You may contact the same Elmer on multiple bands for bonus points. If you are an Elmer, you earn 10 bonus points for each tue you receive. Elmer to Elmer QSOs count for a tue bonus; after all, you are colleagues and can appreciate each other! Finally, since it is summer and 6 meters has been opening up, each QSO on 6 meters is worth 10 bonus points, on top of any Elmer-related bonus points a 6-meter QSO may earn you. Your bonus total equals your Elmer-related bonus points, plus any bonus points for 6-meter QSOs. Feel free to keep a printout of the Elmer roster at your side on Aug. 12; let's show these folks how much we appreciate them! By the time July's Weekend Sprintathon rolls around, Independence Day 2012 in the United States will have come and gone. But we can still celebrate. July's WES, starting at 00:00 UTC July 8, aims to recognize the major players: the 13 original colonies, plus Britain and France. For the record, the colonies include: GA, SC, NC, VA, MD, PA, DE, NJ, NY, CT, RI, MA, and NH. Maine was part Massachusetts until 1820. So for this event and this event only, either ME or MA count as MA, ayuh. A QSO with a member based in one of the 13 colonies is worth 25 points -- only one QSO per colony counts toward the colony bonus total. Contact any station in the UK and France for a one-time country bonus of 250 points. A clean sweep of the colonies allows you to multiply your colony total by 13 (no multi-band sweeps). Sweep the UK and France, and you can multiply that total by 2. Your bonus total is the sum of your colony points and your UK/France points. Here's how it works. Each member using an all-tube rig can claim 100 bonus points. Those with hybrid radios, combining tube and solid-state stages, can claim 50 points. Note the zero. Every participant should include the number of tubes, even if zero, so others don't have to ask for the information. Your total bonus points equals the total number of tubes other ops send during the exchanges you log, plus, if you're operating a boat anchor, the boat-anchor bonus. Multiband contacts with the same boat-anchor op are allowed when adding up your tube totals. As Les, WB5JWI, likes to remind us with each post to the SKCC Yahoo group mailing list: Real Radios Glow In The Dark And Keep The Shack Warm In Winter! One other note: The SKCC board is considering the addition of two new calling frequencies -- one on 15 meters and the other on 10 meters -- to provide alternatives if some heavy contesting is under way during SKCC operating events. The frequencies are 21.114 Mhz and 28.114 Mhz. Let's give these a test drive during June's WES, conditions willing. Calling all bucks and does! We have this award kinda sitting dormant. It's called the Young Buck award. Nobody's snagged one since January 2011. It isn't just for bucks; at least one "doe" has earned it. And it isn't just for young 'uns. More, er, mature members can earn it, too. It's simple. Collect the ages of the members you contact, invert each age to become a fraction. When the fractions you've collected total at least 1.0, you earn the award. This month, if you want to max out on WES bonus points, swap ages. Add your age to your name during an exchange with a /#. Pete becomes Pete/15. Just kidding. I'm older. Now for the bonus points. You can earn them in three ways. And you can use any or all toward your final score. Convert the individual ages in your log to decimal fractions, total them, then multiply the total by 1,000. That's right. If your fractions total 0.800, then you get 800 bonus points! If the sum of your fractions exceeds 1.000, enter 1,000. (I learned that trick from the IRS.) Round your fractions to three decimal places. The fraction .333333333 becomes .333. A member's age can be used only once during the event toward this total. You can earn 25 bonus points for each member 30 years old or younger you work -- multiband contacts count for this bonus. Finally, if you haven't already, meet Ethan, KB1WMR, SKCC 9060. He's 12, and he's fresh off of his experience as one of several Morse-home-state bonus stations in April. He and he alone is worth 75 points per band, in addition to a one-time use of his inverted age. Keep him busy! Note: Include in Bonus Category 1 only QSOs between SKCC members. Example: You only get on for a short operating stint and work four stations -- WB1LAH, who is 50, W1BIG, who is 43, W1HUP, who is 25, and KB1WMR, who is 12. 1. To convert the ages to fractions, for each unique SKCC member you work, divide 1 by the age that member sends. In this example, that yields 0.020, 0.023, 0.040, and 0.083 respectively. Add them, then multiply by 1,000. You would get 166 bonus points for this category. 2. You work W1HUP on three bands. Since she's 30 years old or younger, she's worth 25 points per band. That's 75 additional bonus points. And if your age-related fraction remains less than 1.0 after the event? Consider that a foundation for future YB QSOs, if you are so inclined! When the RMS Titanic sank April 15, 1912, the already heavy loss of life could have been complete without the contributions from two men to communications technology: Guglielmo Marconi and Samuel F.B. Morse. Marconi and Morse were born at the end of April. April's SKCC Weekend Sprintathon taps its key to the two inventors and to the event whose outcome their work influenced. "We are sinking fast passengers being put into boats"
Each complete word is worth 10 bonus points. In addition, each station from Massachusetts (Morse's birth state) or Italy (Marconi's country of origin) you work is worth 10 points per band. Finally, and on a lighter note, as a nod to Spring Break, 50 additional bonus points to those who can provide the WES submissions page with the last name of a female singer whose rock band refers to Marconi in the lyrics of one of its songs! To recap: 10 bonus points per word for building as much of the Titanic's final message as you can from calls you work; 10 bonus points per MA and/or ITA station per band; and a one-time bonus of 50 points for the only reference I know of to Marconi in rock-and-roll lyrics. Radio-literate, that band was! OK, basketball fans. It's time to shoot some SKCC hoops! As you work stations during this month's WES, earn bonus points by mining the call signs you log for letters that spell the names of eight collegiate mascots. The eight represent schools whose teams won the US NCAA Division 1 national men's championship between 2000 and 2011. The mascots are, in alphabetical order: Blue Devils, Gators, Huskies, Jayhawks, Orange, Spartans, Tar Heels, and Terrapines. Each mascot is worth 25 points. Sweep all eight and you can tack on an extra 100 for 300 possible bonus points. A quick check of WES results pages from the past couple of months shows that all letters are present and accounted for (each month!). You can use each letter in a call sign only once. This should be a slam dunk! The theme for the February WES is QRP. The scoring for this WES will be a little different from past QRP sprints. For this WES, if you contact a member who is operating QRP, you can take a 5-point bonus per member, per band. If you make a contact with a member who is operating QRPp, you can take a 10-point bonus per member, per band. For this WES, QRP is defined as 2 to 5 watts. QRPp is defined as 1 watt or less. Members using QRP or QRPp power levels, please send QRP or QRPp just prior to SKCC number during your exchanges. Pete, W1PNS, SKCC 4853T, will be using the club call sign, K9SKC for an extra 25 point bonus per band. Good luck to all, and most of all, have fun! The January 2012 WES will occur during the club's month-long Sixth Anniversary Celebration. That means members volunteering as special-event operators are likely to participate in the Weekend Sprintathon using two calls: the Anniversary's special-event call, K3Y/#, for part of the time, and their normal calls. When you tally your WES QSOs, however, you can still only count one QSO per band per member. So use a member's SKCC number, rather than call, to check for dupes. Why? This will allow you to work K3Y/2 when WB2LAH is using the call *and* when W2OOF uses it later in the event. You can count both QSOs toward your total because different members are involved. You may not, however, contact WB2LAH as himself and as K3Y/2 and count both if both QSOs are on the same band. One QSO per member per band. For K3Y volunteers participating during January's WES, contacts you make as a K3Y operator qualify as WES contacts -- again, one QSO per member per band. But include only the contacts you made as K3Y/# in the log you submit to your K3Y regional coordinator after your operating period ends. There is no designated Special Member for this sprint. The theme for the December 11, 2011, WES will be Board Bonus Bonanza. For this month's WES, all five members of our SKCC Board of Directors have agreed to be bonus members. Each board member contacted will be worth 25 bonus points per band. If you contact all 5 board members, you can take an extra 100 bonus points! With all these bonus points available, we should have some big scores! The 5 board members will be the only bonus members for this WES. The 5 board members are: N6WK-Gordon, KB4T-Frank, AC2C-Ron, N2JNZ-George, K9JP-Jeff. The DX Bonus member is John, VK4TJ, SKCC #4474T. John will be operating from Top Camp, Australia. With propagation getting better, John should be an easy catch for most of our members! Watch for John on the K3UK sked page. The K9SKC club call sign will be used by Randy, KB4QQJ, SKCC #3508T. Randy will use the K3UK sked page, too. These two fine operators should be able to pass out lots of bonus points this month. Each of these members will be worth 25 bonus points per band. The idea for this WES is based on old traditional ham-radio sprint rules. It seemed like a real fun theme idea and will challenge members to spin the big knob. Here’s how it will work. For this WES, initiate a contact by calling CQ (hit) and when the contact is complete change frequency (run). The person that answered that CQ can now call CQ on that same frequency, make a contact (hit), then change frequencies (run) to call CQ -- or search and pounce again. Of course, you may search and pounce for the whole WES if you choose to do that. At this point KC9KHG has to “run,” but W1PNS can stay on that frequency and call CQ. Once he gets an answer to his CQ and completes a contact, he has to “run." All other WES rules will be the same. Milt, K4OSO SKCC 180T will use the club call K9SKC for 25 bonus points per band. Good luck to all, and most of all, have fun!! To honor all those who lost their life on that terrible day 10 years ago, all SKCC members are invited to refrain from operating between 0000 UTC to 0011 UTC. September's WES will officially start at 0012 UTC. The theme for the sprint is "Ordinary Average Guy," which means that for this sprint, Centurions and Tribunes will not be worth any extra points. Instead, any member without a C or T endorsement will be worth 10 bonus points, but only once during the event, not per band. This should help some of the newer members get a jump on their C and T endorsements. George Ossier, N2JNZ, SKCC #2836T, will be using the club call K9SKC. George will be posting to the K3UK sked page when he is on the air. Good luck to all and most of all...have fun! It's summer, and people aren't the only ones taking vacation during the month. The "theme" for August's WES has opted to take a vacation as well, and as a result, it won't be available for the event. However, we will carry on without it. Larry Mergen, K0LWV, will operate as K9SKC. His SKCC number is 3571. And Thomas Horston, M0TRN, SKCC 7344, will operate as the special DX member for the August WES. We're looking forward to hearing our newest members on the air during the event, as well as our long-time members! The theme: "QRP." For the purpose of this sprint, QRP is taken as five watts or less. Although participants are encouraged to go on the air at a QRP power level, you do not have to do so to participate.For Extra bonus points you can choose from the higher of these two options: 1) 15 bonus points if you can make at least 1 QSO at a QRP level. 2) 2 bonus points per QSO at QRP levels, but if you choose this option, you may not claim 15 points for the first QSO you make at QRP levels. If you change power levels during the course of the sprint, enter your results in the category corresponding to the highest power level you used. You can still claim the QRP bonus as described above for the QRP QSOs you've made. There will be no Special SKCC member during this sprint. The club call K9SKC will be used by Werner, N8BB, SKCC #5433T. He will be operating at QRPp power to make it a little more of a challenge to get those extra 25 bonus points per band. Werner will post to the K3UK sked page when he is on the air. As always with the SKCC sprints, the themes are presented as activities to generate a little more fun during the sprint. If, for whatever reason you can not meet the requirements of the theme, you are still welcome to participate. Use the soapbox and photo option for show-and-tell of your QRP set-up. The theme: Boat Anchors! Participants are encouraged to go on the air using boat-anchor equipment. For the purpose of this sprint, a Boat Anchor is loosely defined as a transmitter or receiver that has some, or all, tube components. You can claim extra bonus points if you have made at least two contacts while you are using a boat anchor. You get 15 extra bonus points if your rig has a mix of tube and solid state components. You get 30 extra bonus points if your rig uses only tube components. "Rig" includes transmitter and receiver, whether they are contained in a one-piece transceiver or sit on your desk as separate components. Don't get picky about asking what to do if you power a tube rig with a solid-state power supply. You decide how you want to count that. In any case, when you submit your results, show us your rig in the optional photo section of the results page and tell us about it! The special SKCC station for June's WES is Kare, YU7AE. The Special SKCC Member for the May 8, 2011 WES is Bernard (F5DE), SKCC #6247C. He will be operating from Touvre, France. He can operate on 80m through 10 m but he is not permitted to operate beyond 7100 on 40m. Since it is a WES you are welcome to spot his location on any of the web spotter pages. The theme for the sprint is "It's Not My Usual Antenna". The weather should be nice for getting outdoors and putting up a new antenna to try out. You can use a proven design, or a modification of a known design, or dream up something yourself. You can use commercially available parts but please no complete antenna kits. Put up the antenna before the sprint and use whatever test equipment you want to "tune it up". You can go on the air with it beforehand with as many QSOs you want to verify that it works and determine if you need to make adjustments to improve its performance. You can make more than one new antenna and switch between them during the sprint. If you find out during the sprint that the new antenna is not working out, you can go back to your regular antenna. On the results submit form you can claim a special bonus of 15 points if you made at least ONE contact with a new antenna but 25 points for more than one contact. In the optional photo submit you can show us your creation. In the soapbox describe how it was made and tell how it performed in case others want to duplicate it. As is always with the SKCC sprints, the themes are presented as activities to generate a little more fun during the sprint. If, for whatever reason you can not meet the requirements of the theme, you are still welcome to participate in the sprint. The SKCC Special Member for the March 13, 2011 WES is Joerg, #7150T operating station DL9YCS from Enger, Germany. He is limited to about 100 w. on 40m to a G5RV but has an amp and a two element quad for 20m and 10m. PLEASE NOTE THAT SOME LOCALITIES MAY BE CHANGING THEIR CLOCKS TO DAYLIGHT SAVINGS TIME DURING THIS WEEKEND. THESE CHANGEOVERS DO NOT CHANGE UTC. THE SPRINT STILL STARTS AT 0000 UTC AND ENDS AT 2359 UTC. YOUR CORRESPONDING LOCAL TIME IS THE TIME THAT IS BEING CHANGED. The theme for the March 2011 WES is "Junkbox and Unusual Keys". For this you are asked to put together a key from "ordinary stuff" that would not normally be considered as a part of a telegraph key. Make it work and try it offline. If it works well enough to go on the air with it, give it a shot. The emphasis is on uniqueness and imagination rather than craftsmanship. The photo submit place is where you can show off your creation. If you build something that doesn't work right, use whatever key you want. You don't even have to try building a key to participate. Have fun. The SKCC Special Member for the February 13, 2011 WES is Urb, #6668T. He will be operating as KP2/W2DEC from "Radio Reef" on St. Croix island. He will be making use of the K3UK sked page to announce his presence. For information on the station he will be using, Google "Radio Reef." The January 9, 2011 WES will occur during the month long K3Y anniversary celebration so there will be special rules for logging and counting QSOs involving K3Y stations. K3Y station operators will give their SKCC number in the exchange. They may also give their home call sign. If they don't give their home call you can ask for it or use the SKCC number to look it up. Use that information along with the band information to determine if the QSO is a dupe or if it can be counted. Note that this allows you to work and count more than one K3Y/n on the same band provided they are with different stations as K3Y/n. If you are using the K2RFP sprint logger you should put the home call in the call sign edit box and put the K3Y/n info in the comment edit box. This will allow the sprint logger to correctly identify dupes and calculate your score correctly. You may have to devise some other logging scheme if you are using some other logging program. If you are operating as K3Y during the sprint you can count your K3Y QSOs toward your score as you normally would for the sprint. In effect you will be doing double logging during the time you are acting as a K3Y operator; a log for WES and a log for K3Y. Just be careful when submitting your log to your K3Y regional coordinator that you only include the QSOs made during your scheduled time as K3Y. The Special SKCC Member for the January 10, 2010 WES is Brian, VE5CUL,1672. Brian will be operating from Dinsmore, Saskatchewan, Canada. He will be making use of the K3UK sked page to indicate his presence. Please note that this sprint occurs during K3Y so special rules for QSOs, with and from, K3Y apply. Since K3Y operators give their SKCC number in the QSO, use that number as the key to the home call and QTH for the QSO. Accept or reject the QSO as a duplicate according to the home call and QTH information. K3Y OPERATORS ARE NOT TO SUBMIT SPRINT RESULTS UNDER A K3Y CALLSIGN. K3Y operators may apply their K3Y QSOs to their sprint result under their home call. This sprint will have an optional poll question on the submit form. You will be asked what you think the final QSO count will be for K3Y. The person coming closest to the final answer will be awarded a prize, yet to be determined. In the case of a tie, the earliest entry will be declared the winner. Don't forget to enter a guess. You can't win it if you are not in it. The Special SKCC Member for the February 14, 2010 WES is Bert, F6HKA SKCC# 6069T. Bert will be operating from Limoges, France. He will be making use of the K3UK sked page to indicate his presence. The basic rules for operating and scoring apply to this sprint. Have fun. The Special SKCC Member for the March 14, 2010 WES is Brion, VE3FUJ,SKCC# 4936. He will be operating from Harriston, Ontario, Canada. Brion will start on 80m and operate from 0000 to 0130, then try 160m until 0230. Around 0300 to 0400 you might find him on 40m. He will also try 20m betweeen 1200 and 1300, 15m between 1400 and 1500, and 10m between 1700 and 1800. All times are in UTC and are subject to change due to band conditions. He will do what he can to make use of the K3UK sked page indicate his whereabouts. The SKCC has in the past run a WES in late winter or early spring with a Junkbox Key theme. The March 2010 WES will follow in that tradition but will also pay tribute to Dave Ingram (Silent Key), SKCC# 2684. Dave wrote a column for CQ Magazine. Many of his articles were about keys - from keys of yesteryear to those of the present, from simple contrivances to elegant pieces from master craftsmen. To pay tribute to Dave use the letters and numbers of the call signs of the stations you work to spell out "DAVE INGRAM 2684". Use each letter and number only once. For extra bonus points you will be asked on the submit form how many of the fourteen letters and numbers you have collected. The analysis program will give you four points for each. For the Junkbox part of this sprint you are asked to put together a key from stuff you find in your junkbox and go on the air with it. The emphasis is on uniqueness and imagination rather than craftsmanship. The photo submit place is where you can show off your creation. If you build something that doesn't work right, use whatever key you want. You don't even have to try building a key to participate. Have fun. The Special SKCC Member for the April 11, 2010 WES is Andy, UU1CC, SKCC# 3072C. He will be operating from Kerch, Ukraine. The Special SKCC Member for the May 9, 2010 WES is Bernard (F5DE), SKCC#6247C. He will be operating from Touvre, France. He can operate on 80m through 10 m but he is not permitted to operate beyond 7100 on 40m. Since it is a WES you are welcome to spot his location on any of the web spotter pages. The Special SKCC Member for the June 13, 2010 WES is Bob (VE3CWU), SKCC#5133T. He will be operating from Toronto Ontario Canada which is in the Eastern Daylight Time zone. Bob plans to start the WES on 20m around 14055 and beam west while propagation in that direction is good. As the band fades he will move to 40 and 80 m around 7055 and 3555 beaming east for Europe and over the pole for possible Pacific area QSOs. He will also keep an ear on frequencies close to 7114 for QRS contacts. By 1700 UTC propagation on 20m will likely be up and you might find Bob back there. If openings on 15 and/or 10 occur he will try to jump in there as well. Bob will make use of the K3UK shed page when he can but you are welcome to spot him there also. 15 Extra bonus points if your rig has a mix of tube and solid state components. 30 Extra bonus points if your rig uses only tube components. Rig includes transmitter and receiver whether they are a one piece transceiver or separate components. Don't get picky about asking what to do if you power a tube rig with a solid state power supply. You decide how you want to count that. In the optional photo submit you can show us your rig and tell us about it. The Special SKCC Member for the July 11, 2010 WES is Erkki, (OH7QR), SKCC#6379. He will be operating from Tuusjarvi, Finland. Although the theme for this sprint is to highlight QRP Erkki will be running QRO as his station allows. He will use the K3UK sked page to make his presence known and you are welcome to spot him there also. The theme for the sprint is "QRP". For the purpose of this sprint, QRP is taken as five watts or less. Although participants are encouraged to go on the air at a QRP power level you do not have to do so to participate. 1) 15 bonus points if you can make at least 1 QSO at a QRP level. 2) two bonus points per QSO at QRP level but not including the 15 points for the first QSO. If you change power levels during the course of the sprint, enter your results in the category corresponding to the highest power level you used but you can still claim the QRP bonus as described above for the QRP QSOs you've made. As is always with the SKCC sprints, the themes are presented as activities to generate a little more fun during the sprint. If, for whatever reason you can not meet the requirements of the theme, you are still welcome to participate in the sprint. Use the soapbox and photo option for show and tell of your QRP setup. The Special SKCC Member for the August 8, 2010 WES is Sean (VA5LF), SKCC#4507T. He will be operating from Saskatoon, SK, Canada. He will start the sprint on 20m and move on to 40m and then 80m as band conditions change. He expects to operate during the first four hours of the sprint on these bands and then resume later around 1600 UTC on 20m, 15m, and 10m. He will be making use of the K3UK sked page so you can spot him there. The Special SKCC Member for the September 12, 2010 WES is Lluis, EA3NO, 6653T. Lluis will be operating from Santa Eugenia de Burga, Spain. Although he will be making use of the K3UK sked page to indicate his presence he has also passed along the following guidelines: From 0800 to 1000 he will focus on 40m for the European stations, between 1600 and 2000 he will be looking to 15 and 10m, and finally, from 2000 to 2400 he will focus on 20m. The SKCC Special Member for the October WES is Harold, VE5BCS, #3946C. He will be operating from Christopher Lake, SK, Canada. The October 10, 2010 WES coincides with the 10-10 International sprint so we would like to encourage SKCC WES activity on the 10 meter band. The rules for both sprints require that the operator's club number be passed along in the exchange. The 10-10 sprinters include the number they get in the log they submit if the number is a 10-10 club number else they enter zero. So, when operating on 10 meters in the WES, just send your 10-10 number if you have one. It would help to add a TT before it like this: TT your number. If you don't have a 10-10 number, you can send a zero like this: NR 0, or you can send your SKCC number prefaced with SKCC like this: SKCC your number. It's a few extra characters in the exchange but you have time in a WES and it will help to alleviate the confusion as to what the number is. The number you get from the other operator might be a 10-10 number, or zero, or an SKCC number. If you are submitting your log to 10-10 International you will have to determine if any non-zero number is a valid 10-10 number. Please check their web site for the official 10-10 sprint rules and here for a log entry form. For SKCC, the scoring is simple. Count ALL numbers gathered on 10 meters as Tribunes even though they might not be, and even if they are not an SKCC member. This will eliminate the confusion as to what the number you are get is, and at the same time give a slight bonus for 10 meter contacts. Please note that this special counting as Tribunes is ONLY for 10 meter contacts. All contacts on 10 meters made during the sprints may be applied for credit in both sprints provided they meet all of the requirements set in the rules for those sprints. The SKCC Special Member for the November WES is Tony, IK2SON, #5486T. He will be operating from Senna Lodigiana, Italy. The theme for this sprint is "Homebrew and Restored Keys". Homebrew keys are keys that you made yourself either copying an existing design or something original you dreamt up. You can use parts from other keys, or buy them, or make up your own. Just about anything goes, except assembling a key from a complete key kit does not qualify. If you have restored an old key instead of building a new one, we would like to see that as well. Whether it is a new or restored key, tell us about it in the soapbox section and show us a photo. Note that the submit page allows only one photo to be submitted so if you want to show us a before and after of a restored key you will have to use a photo editing program beforehand to make a single composite image. Key builders should consider entering their work in the Society for the Preservation of Amateur Radio (SPAR) homebrew key contest. Information can be found at the "Key Month" link here. The SKCC Special Member for the December 12 WES is Timo, OH5FNI, 6378. He will be operating from Uukuniemi, Finland. Timo does not have an internet connection so he will not be using the K3UK sked page directly but his friend Erkki may be posting for him. If you hear him, you can spot his whereabouts on the sked page. Timo plans to work during his early morning hours starting at 0200 UTC on 80m and 40m, then after 0800 UTC on 20m and the upper bands. As we do in December, use the photo section on the results submit page to show us how you have your ham shack, key, rig, or antenna decorated for the holidays. The January 11, 2009 SKCC sprint (WES) will feature Walt (LW3EX) as the Special SKCC Member for the sprint. Walt has been very active in SKCC, particpating in many of the sprints, and engaging in numerous non-contest chats with other SKCC members. As the Special SKCC Member for this sprint there will be a special bonus of 25 points for each band you work him on. This is in addition to the 10 points for his Tribune status. Walt will work 20m, 15m, and 10m and use the K3UK sked page to announce his whereabouts on the bands. > If you contact a K3Y station you should use the SKCC NUMBER of the K3Y operator to determine if is a duplicate and count it accordingly. So a QSO with K3Y/2 operated by K2ABC and later, one with K3Y/2 operated by K2XYZ are not duplicates and can both be counted. To encourage making contact with K3Y stations there will be a "special bonus" of 10 points for each countable K3Y contact. You will need to keep a tally for that and enter the total points on the submit form. The special bonus points for these contacts is on top of the points you would otherwise get for that contact. If you are operating as K3Y during the sprint you can count those QSOs for the sprint as though you are using your own call. Use your own call on the submit form. Do NOT use K3Y. The February 8, 2009 WES will feature John (G0RDO) as the Special SKCC Member. John is a frequent user of the K3UK sked page so you might find out what he is up to during the sprint by checking there. Remember, the 24 hour WES does allow the use of internet sked pages. The standard scoring rules apply and that means you can claim a 25 point bonus for each band that you work John on. The theme for the sprint is the traditional Junkbox Key Sprint. The idea is to put together a key from stuff you find in your junkbox and go on the air with it. The emphasis is on uniqueness and imagination rather than craftsmanship. The photo submit place is where you can show off your creation. If you build something that doesn't work right, use whatever key you want. You don't even have to try building a key to participate. Have fun. The March 8, 2009 WES will feature Fred (VE3FAL) as the Special SKCC Member. Although Fred likes to work QRP he will work the sprint as QRO at 50 watts into a loop antenna and be pounding away on his Kent straight key. You are likely to find him on 40m and 80m but you can check the K3UK sked page for spots. The standard scoring rules apply and that means you can claim a 25 point bonus for each band that you work Fred on. The April 12, 2009 WES will feature Rob (G4LMW) SKCC# 4454C as the Special SKCC Member. Note that it is after midnight at Rob's QTH (Berkshire, UK) when the WES starts. He will put in a little time on 40/80m at the start. Then around 1300 UTC you might find him on 20m and again around 2100 UTC on the lower bands. Check the K3UK sked page for spots. On April 25, 2009, the Cornish Radio Amateur Club from the UK will run a special event in celebration of Marconi's birthday. So as a tribute to Marconi our WES this month will provide for an extra bonus of points when you submit your results. On your notepad write: "Guglielmo Marconi, April 25, 1874". As you work stations during the WES, use the call letters from the station to cross off the letters and numbers in the name and birthdate. Use each letter/number from a call sign only once, unless you work the same station on another band. When you submit your results at the end of the sprint, give yourself 5 extra points for each letter/number you have crossed off. In addition to the Extra bonus points, the standard scoring rules apply and that means you can claim a 25 point bonus for each band that you work Rob on. the EUCW Fratinizing CW QSO Party. Since it is a WES you are welcome to spot his location on any of the web spotter pages. The Special SKCC Member for the June 14, 2009 WES is Jan, (PA3CLQ), SKCC# 2765. He will be operating from Geertruidenberg, NB, Netherlands. Please note that the start time of the WES is in the middle of the night for Jan so his operation at the start may be limited. Since it is a WES you are welcome to spot his location on any of the web spotter pages. He will be making use of the K3UK sked page. 25 Extra bonus points if your rig uses only tube components. This sprint will also mark the start date of a new SKCC DX award and it should provide a good opportunity to start racking up some QSOs/Countries toward that award. Click here:http://www.skccgroup.com/operating_awards/dx/ for details on this new award. The Special SKCC Member for the July 12, 2009 WES is Allan, HC2A, SKCC# 3671T. He will be operating from Guayaquil, Ecuador. Since it is a WES you are welcome to spot his location on any of the web spotter pages. 1) 15 bonus points if you can eke out at least 1 QSO at a QRP level. 2) two bonus points per QSO at QRP level. 1) If you copy both sides of a QSO you can count that as two QSOs. 2) You can count the same call again in another QSO only if it is on a different band. 3) Follow the rules that apply to hams for counting multipliers and C/T bonus points. 1) Enter in the SWL category. your last name. Please note, it should be just a one word identification. 3) For SKCC number, if you have one, enter it else enter SWL. above. You are not eligible for the Extra bonus points for operating QRP. The Special SKCC Member for the August 9, 2009 WES is John, ZS6JBJ, SKCC# 3808. He will be operating from Staalveld, Republic of South Africa. John has a Yagi for operating on 10,15, and 20 m, and a dipole for 40m. He does not have access to the internet spotter pages from his station but his plans are to operate on 7.050 MHz from 02:00 to 04:00 UTC and on 14:050 MHz from 14:00 to 20:00.UTC. Band conditions may require a change in plans. Since it is a WES you are welcome to spot his location on any of the web spotter pages. We will continue to offer the Shortwave Listeners category for this sprint. See last month's sprints below for details. Standard scoring rules apply. No special theme for this sprint but we can still have fun with it. September generally marks the beginning of a new school year so the theme for this sprint relates to those wonderful times you had in school. Think back to the subject or class you enjoyed most. Match it with one of these broad categories: Math, Science, Literature (reading and composition), and Social Studies (history, government, cultures). All others like lunch, recess, art, gym, shops, etc. will be classified as OTHER. If you were a late bloomer that didn't care much for early schooling but then found something of interest later in life, fit that into one the categories and use it. Whatever you pick, stay with it during the entire sprint. Use a checkmark or X to fill in the appropriate box for the stations you work. Use only one mark per box. You can count any subject in the "Free" column and any band in the "Free" row. So if you worked five stations with three that sent you SCI and two that sent you SOC, you can check one box in the SCI column, one box in the SOC column, and have three more for the Free column. At the end of the sprint you can claim an extra bonus of two points for each box that you checked off. If you don't get the info during a QSO you can't count it toward the extra bonus points. In the soapbox submissions, why not take a break from details of rigs, keys and antennas and instead, tell about one of your memorable school experiences. So get those lathes and milling machines humming. Jeff will operate for a while at the start of the sprint and then for several hours at the ednd of the sprint. He has an inverted vee for 80/40 and a 3-element yagi for the upper bands. He will make use of the K3UK spotter page so you can find his whereabouts by checking there. The February 2009 sprint was devoted to junkbox keys where the idea was to build and use a key using simple hand tools from stuff you found in your junkbox. This sprint also involves building and using a new key but this time you can use any materials and use any tools. You can use store bought parts or parts from other keys. Please, no key restorations or building from a kit. The final result should be an original item. The sprint is called the Craftsman Key Sprint to encourage the skilled craft persons out there to show us their stuff. Use the photo and soapbox sections on the submit form to show off your masterpiece. In the past, some SKCC members have also entered their homebrew keys in the competition sponsored by The Society for the Preservation of Amateur Radio. Information found here: (SPAR). Official SKCC keys include straight keys (STK), bugs (BUG), and side swipers (SSW). For the purpose of this sprint, choose one of these types as your favorite and stay with it during the sprint. You "stay with it" in the exchange but you do not have to stay with it in use during the sprint. Switch keys in use as you see fit. As you log your contacts you can check off the key info you get in the grid shown below. If you don't get key info you should ask for it. If you get something specific like "NAVY FLAMEPROOF" you can translate that to appropriate category. QSOs with no key info sent do not count for grid filling. If you have more than five QSOs with any one type you can check the extras off in a FREE box. When you report your results you will be asked how many boxes you have filled in. The analysis program will award you "Extra" bonus points based on that amount. Have fun with it. The Special SKCC Member for the December 13, 2009 WES is Vince, S52CC, 5011. He will be operating from Maribor, Slovenia. His antenna works best on 40m so he plans to spend most of his time on that band. He will be on the K3UK webpage and he will do his best to make contacts through that webpage. One hundred years ago this month Guglielmo Marconi won the Nobel Prize in Physics for his work on wireless communication. This bit or radio history will serve as the basis for extra bonus points for this month's sprint. On your sprint worksheet write the phrase "GUGLIELMO MARCONI NOBEL PRIZE 1909". Use the letters and numbers from the call signs of the stations you work to check off the letters and numbers in the phrase. Use each letter and number only once. When submitting your results you will be asked how many letters and numbers you have checked off. The results analysis program will award two points for each one checked off. As we did last December, use the photo section on the results submit page to show us how you have your ham shack, key, rig, or antenna decorated for the holidays.